If you want to use Von Croy in your level, then you need the VON_CROY object and his MESHSWAP1 in your WAD. You can find both in the original WAD of the 'Angkor Wat' TRLR level. Von Croy's setup will work properly only if your level is the first level of the game (i.e. if it has the first [Level] block of the Script). Maybe you think you can pretend that your non-first level is the first level (so that you can use Von Croy there perfectly), if you force Value 1 in this Code Memory Zone field, till the next level jump: Current Level number (more updated than savegame memory) (Byte). Unfortunately, as my experiences indicate, this is not true. When we activate Von Croy then he will appear where he is placed, drawing his knife at once. 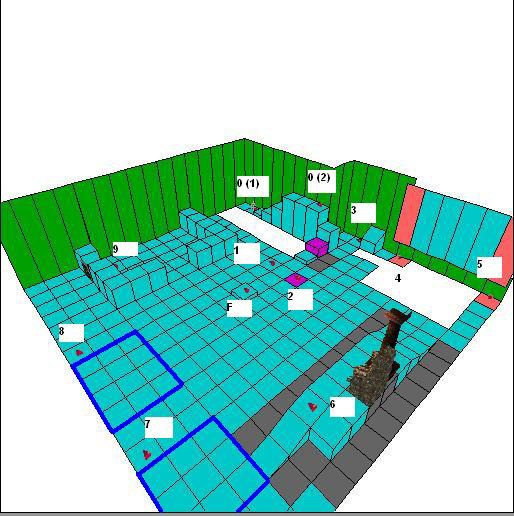 Then we will use F30 triggers to move him between the AI_FOLLOW objects. Each F30 is connected to the AI_FOLLOW that has the same number. This number must be typed both in the Timer window of the trigger and the OCB panel window of the AI_FOLLOW. Activating F30 having 0 in the Timer window will send Von Croy from the first AI_FOLLOW having 0 in the OCB window to the second AI FOLLOW having 0 in the OCB window, activating F30 having 1 in the Timer window will send Von Croy from the second AI_FOLLOW having 0 in the OCB window to the AI FOLLOW having 1 in the OCB window etc. 1. Von Croy always tries to find the shortest way. a, If he can't find any way between two AI_FOLLOW's then he goes to Lara, and wherever she goes, he will try to follow her tightly. b, If the path between two AI_FOLLOW's is too complicated then Von Croy may try to find some shorter way - even if that does not exist so he can be stuck this way. Maybe he starts walking-running around a big part of the map, seemingly without any purpose. c, When Von Croy searches for the shortest path then he will detect Lara as an obstacle in his way. He may stop in his tracks - temporarily - when bumping to her. d, Sometimes Von Croy can choose between two or more shortest ways if there aren't big differences between the lengths of the paths. So, if you play the level first then maybe he will choose Path A, but when you play the level at the second time then maybe he will choose Path B.
e, When we say 'shortest' then that also includes the horizontal and the vertical moves. If the path or a part of it is longer, then Von Croy is always walking first for a short time then starts running, and brakes when reaching the 'destination' AI_FOLLOW. - And that is the reason for the permanent walk on short distances: Von Croy doesn't have enough space for a 'running then braking' animation. (Sometimes he 'brakes' later than it's needed, and stops a bit farther from the AI_FOLLOW. It is not a problem, the game will fix it - adjusting him to the AI_FOLLOW - if it is needed. 3. If he reaches the 'destination' AI_FOLLOW, Von Croy will always turn towards Lara and waves to her to come. 5. Von Croy will jump over gaps or shimmy or climb higher ledges (on/off) or use switches if you use OCB codebits at AI_FOLLOW's. 6. 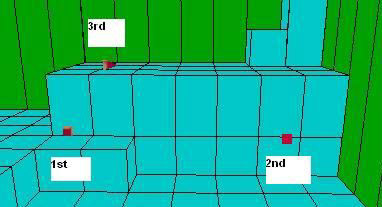 Von Croy will cross ledges, if the vertical distance between two adjacent ledges is not more than 4 clicks. If this distance is 1 click, the he will step up on/down from that. If it is 2, 3 or 4 clicks then he will climb up on/down from that. c, the vertical distance between the floor square of the AI_FOLLOW and the ceiling square above that must be exactly 6 clicks or else Von Croy will be stuck at that AI_FOLLOW. a, He will swing from one ceiling to another even if the vertical distance between them is huge. But that is illogical, of course. b, If the gap is not too wide so it can be crossed by a jump, but you set it up to cross it by monkey swinging then Von Croy may be stuck there. 9. Von Croy won't climb ladders or won't crouch/go on all four or won't swim. 10. Von Croy will step into water or quicksand pools (and get out of them) if they are not deeper than 1 click. 11. Von Croy won't step into the areas that are marked by the grey Box button. 13. Either he's going between two AI_FOLLOWs or standing at an AI_FOLLOW, Von Croy - interrupting his route - will attack enemies with his knife if they are too close to him (I think, 'too close' is about 3 squares now, horizontally). Now Von Croy tries to keep this distance, so if the enemy goes further from him, then he will follow the creature. If he has killed the enemy then he goes back to his route. a, If he put away his knife before, because of the monkey swing, now he will draw it again. b, He will interrupt his route even if he can do it only in a complicated way: for example, he will swing back on the monkey bars to fall down at where jump up to the bars, to get the enemy. c, If he loses the track of the creature then Von Croy will go back to his route without hurting/killing him. d, Let's suppose Von Croy is going to AI_FOLLOW having 8 or he is there. If an enemy is near him, then he attacks that. If Lara activates now the flipeffect that sends him to AI_FOLLOW having 9 then he will go to AI_FOLLOW having 8 (! ), leaving the enemy alone. After that two cases are possible: one of them is Von Croy will come back to the creature to kill that, then he will go to AI_FOLLOW having 9. Or, if he lost the track of the creature, then he will just follow the order of the flipeffect. 14. Von Croy will activate HEAVY type triggers at an AI_FOLLOW when he just reaches that AI_FOLLOW. Or, he will activate any HEAVY type triggers anywhere on his way, if you use a NEF_EASY_HEAVY_ENABLING flag on him by an Enemy Script command. However, it's highly recommended to use NEF_EASY_HEAVY_ENABLING, even if you want to activate HEAVY triggers only at AI_FOLLOW's, otherwise performing some special procedure of Von Croy may kill each HEAVY trigger of him that haven't been activated yet. Von Croy is placed at the first AI_FOLLOW having 0. Lara triggers him so he will appear there, drawing his knife at once. Then Lara triggers an F30 having 0. At the left side of Von Croy there's a wall, and at the right side of him there's a gap so he starts climbing the ledges in front of him (because there is no other way) to reach the second AI_FOLLOW having 0 on the top of the blocks. (He walked all the way, because the path is divided into short parts because of the short ledges.) He starts waving to Lara. Then Lara triggers an F30 having 4. First, Von Croy walks to the AI_FOLLOW having 2. (Though, the path wasn't divided now, he didn't run because the distance was too little to run and brake on this short path.) There's a HEAVYANTITRIGGER at the AI_FOLLOW, to put out the previous flame. (We don't need a NEF_EASY_HEAVY_ENABLING flag to activate HEAVY triggers at AI objects, so Von Croy will activate that trigger even if you don't use that flag.) He stops at that AI_FOLLOW only for a moment, then continues his way (between the gap under the monkey bars and the two Box squares) to the AI_FOLLOW having 3 - first walking, then running. He stops there only for a moment, then climbs up on the block in front of him. (The block is slanted, but the slope is perpendicular to the path.) He climbs down on the other side, and walks to the AI_FOLLOW having 4. He starts waving to Lara. Then Lara triggers an F30 having 6. The AI_FOLLOW having 6 is on the near ramp, so Von Croy walks then runs there. We want him to do that by going all the way on the ramp. That's why we used those Box squares at both side of the ramp: without them, Von Croy will go to one side of the ramp, climb up, and go to that AI_FOLLOW. (The Box squares below the objects on the ramp are necessary, or else Von Croy can cross them, not detecting their collision.) He starts waving to Lara. Then Lara triggers an F30 having 7. Von Croy starts walking (then running) down the other end of the ramp, crosses the water pool (which is only 1 click deep) to the AI_FOLLOW having 7. He starts waving to Lara. Then Lara triggers an F30 having 8. Von Croy starts walking (then running), around the other pool that is 6 clicks deep, so he cannot cross that. Reaching the AI_FOLLOW having 8, he starts waving to Lara. Then Lara triggers an F30 having 9. Von Croy starts walking (then running) towards the AI_FOLLOW having 9. The blocks around that are too high (5 clicks), so he can't climb over them. He has two choices: through the open part in the middle of the blocks or through the door (which is next to that AI_FOLLOW). The shortest path is if he chooses the door, so he will go towards there. Lara will open the door before Von Croy reaching there, or else Von Croy will be stuck at the closed door and will get through only if Lara opens the door after that. Reaching the AI_FOLLOW having 9, he starts waving to Lara. 1. You should place the AI_FOLLOW's exactly on the floor. Place them anywhere else only if I say that in this tutorial. 2. Maybe you want to re-edit the route, saying, you don't need AI_FOLLOW having 7 any more, so you'd like to remove it, sending Von Croy from AI_FOLLOW having 6 straightly to AI_FOLLOW having 8. If you do like that then Von Croy will go to Lara (after leaving AI_FOLLOW having 6) and follows her tightly, whatever you do. The only possibility to skip using an AI_FOLLOW between the adjacent AI_FOLLOW ID's if you are using cutscenes - see more about it below. When he's between (the way like that) the two AI_FOLLOW'S then use that F30 to move him in the proper way to the AI_FOLLOW with 0 (or use another F30 with a bigger number to move him further, skipping that AI_FOLLOW). a, If he is at that AI_FOLLOW then he drops any activity until we activate the F30 of the AI_FOLLOW (to accept the proper activity again) or an F30 with a bigger number (to send him further). b, If he is heading for that AI_FOLLOW then he will act exactly the way he acts when we move him from the starting AI_FOLLOW with 0 without activating an F30 trigger. Until we activate an F30 (to send him further) that has a bigger number than any AI_FOLLOW's that he's left. Now 'heading' means either if he is heading for there because of an F30 having sent him there or he's crossing this AI_FOLLOW though he has been sent to the next AI_FOLLOW by an F30. 7. Von Croy will never move to an AI_FOLLOW if that has a less ID number than the AI_FOLLOW where he is just located. - So eg. you can't send him from AI_FOLLOW having 17 to AI_FOLLOW having 16. But, when you send him from AI_FOLLOW having 15 to AI_FOLLOW having 17 but you activate F30 having 16 before Von Croy crosses AI_FOLLOW having 16, then he will stop permanently at AI_FOLLOW having 16, as if F30 having 17 hadn't been activated yet. - And it doesn't matter if F30 having 16 has been activated before or not. 10. Activating an F30 before Von Croy coming to life, he will start to go there at once (if it is the F30 you activated last) when coming to life. 11. F30 triggers can be activated in any way: by directly Lara, by a switch, by a HEAVY trigger etc. Then use F86 trigger to show/start the timer or turn it back into 0 (in 'show' mode) or stop/remove it (in 'hide' mode). And you can find conditions (local or global triggers) to study the value in this timer. - He can be sent by F30 triggers from one AI_FOLLOW to another one. - He will perform any animation (eg. even climbing up on blocks etc.) that is needed to move him further. - He will use OCB codebits correctly. - He won't wave to Lara. - He won't react (i.e. move further) when Lara is near. - He can't use cutscenes. 2. As I wrote above, sometimes the nearness of Lara is a condition to define for Von Croy how to move. As you'll see below, the 'nearness condition' (though, sometimes in another format) also exists in other cases, for example, with OCB codebits being switched on. If Von Croy won't react in the way I wrote below (so if the 'nearness condition' won't move him, though it should) then activate an F30 to move him. - The peak of the pyramid of AI_FOLLOW has to face in the opposite direction, compared to where the wall of the ledge is. So, Von Croy has arrived to the first AI_FOLLOW, by an F30. Till an F30 sends him further, he will just stand there, not really showing any activity. (I mean, he will wave to Lara if she's closer to him horizontally than 3 squares.) When an F30 to the second AI_FOLLOW has been activated, he jumps up, grabs the ledge, and shimmies. Reaching the second AI_FOLLOW, Von Croy will climb up on the ledge. Now he will act exactly the way he acts when we move him from the starting AI_FOLLOW with 0 without activating an F30 trigger. (So he will move only if Lara is near.) But if we activate an F30 to send him to the third AI_FOLLOW, then he'll go there and starts waving to Lara to come. Experimenting with the direction and distance of the shimmying (i.e. 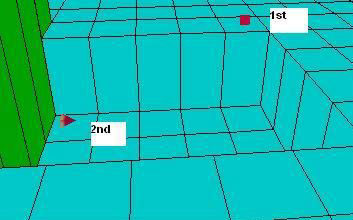 with the horizontal position of the second AI_FOLLOW along the wall) you will experience that Von Croy can shimmy only rightwards (so he can't leftwards) - without the ability of the shimmying around corners -, or, placing the AI_FOLLOW exactly on the square of the first AI_FOLLOW, he won't shimmy but grab the ledge and climb up right away. - The peak of the pyramid of AI_FOLLOW has to face in the opposite direction, compared to where the edge of the ledge is. - The floor of the gap where Von Croy will land have to be exactly 8 clicks under the floor from which he will fall down, or else he will have some animation problem or malfunction. So, Von Croy has arrived to the first AI_FOLLOW, by an F30. He will face the gap. While Lara is further from him than 3 squares horizontally he doesn't perform any activity. If Lara is in the right distance, he will fall down into the gap. Place the first AI_FOLLOW against the wall where he will use the switch. The peak of the pyramid of AI_FOLLOW has to face in the opposite direction, compared to where the wall is. - And place one HEAVY triggers and one or more TRIGGERs below the AI_FOLLOW. Those triggers will be activated when Von Croy uses the switch. So, Von Croy has arrived to the AI_FOLLOW, by an F30. While Lara is further from him than 3 squares horizontally he doesn't perform any activity. If Lara is in the right distance, he will perform an 'I'm using a switch' animation. - No, there is no switch in front of him, on the wall, this time. Only the texture tile on the wall looks as if there were a switch there. 1. As I said above, we probably need a NEF_EASY_HEAVY_ENABLING everyway for Von Croy's HEAVY triggers. But if we do that he will activate the HEAVY when he reaches the AI_FOLLOW, so before he performs the switch-using animation. 2. Naturally this is a 'fake' switch. But what we can do to make him use a 'real' switch? And if we also want Lara to use that? Case#1. Von Croy is the first at the switch. He switches that on, then walks away. Later, Lara can go up to the switch to switch that off, and (later or now) switch that on again etc. Case#2. Lara is the first at the switch. She switches that on. But (later or now) switches that off again, so when, more later, Von Croy goes up to the switch, then he can switch that on again. Preventing the setup from being disturbed, do not let Lara and Von Croy be there at the switch at the same time! - we adjust all the StateID's at ANIMATING1 into 0. Then, delete all the triggers below the AI_FOLLOW. The script has a part of Von Croy, a part of Lara, and a common part. This GlobalTrigger says if the switch performs its Animation1 then the door will open. Animation1 is a one framed loop animation, showing constantly the 'switched-on' state of the 'switch'. So if the switch gets into 'on' position - either by Lara or Von Croy - then the door will open. - the actual AI_FOLLOW where he is. If you want to know what 'absolute animation frame' means, then read about it in the Memory Zone tutorial on Skribblerz. As you see in WADMerger Animation Editor, Von Croy's switching animation is Animation3. Let's suppose its 16th frame is the frame where he grabs the wall switch and starts using that. Let's suppose this 16th frame is the 179th absolute frame, if you search that in the Animation Watcher of NG Center. The trigger above puts the ID of the actual absolute animation frame into Local Short Alfa1 variable. The trigger above puts the ID of the actual AI_FOLLOW into Local Short Alfa2 variable. As you see, there are two numbers at PARAM_BIG_NUMBERS. The first number (in Position0) is 179, the second number (in Position1) is 21. The trigger above examines if the Local Short Alfa1 (i.e. the actual absolute animation frame) is the required 179. The trigger above examines if the Local Short Alfa2 (i.e. the actual AI_FOLLOW) is the required 21. GlobalTrigger2 says if the switch performs its Animation0 then the door will close. As I said above, Animation0 is showing constantly the 'switched-off' state of the 'switch'. So if the switch gets into 'off' position - always only by Lara this time - then the door will close. GlobalTrigger4 says if lots of conditions are true, then Lara will perform her 'I'm switching on a wall switch' animation (Animation63) and the wall switch will perform its switching-on Animation2 ($5000, 155, $20F) - as if Lara were just really using a real switch now. 1. Be careful with the coordinate values (-100, 100, -100, 100, 320, 350, -2000, 2000, -200, 200, -200, 200) in the TestPosition. I mean, we have a TestPosition bug, so X and Z values are inverted. So now '-100, 100' are Z values and '320, 350' are X values. 2. With your switch you may have other TestPosition values, not these ones. GlobalTrigger5 says if lots of conditions are true, then Lara will perform her 'I'm switching off a wall switch' animation (Animation64) and the wall switch will perform its switching-off Animation3 - as if Lara were just really using a real switch now. - and if Lara is performing the proper animation (103) to use the switch, i.e. she's standing and still ($8000, 103, $1E). If the AI_FOLLOW has Codebit 5 on then Von Croy will act exactly the way he acts when we move him from the starting AI_FOLLOW with 0 without activating an F30 trigger. So, when he reaches AI_FOLLOW with Codebit 5 then he will move away a bit from here towards the next AI_FOLLOW, at once. Then he will move further if Lara comes closer to him. To 'really' send him to the next AI_FOLLOW, you need to activate an F30 that sends him there. See above Note#d about 'Von Croy killing the enemies'. If an AI_FOLLOW has Codebit 5 and Lara activates an F30 that sends him to the next AI_FOLLOW, then Von Croy won't leave the enemy till killing that. Then, he will go the AI_FOLLOW to which that F30 sent him. If the AI_FOLLOW has Codebit 1 and Codebit 3 on then Von Croy will lean forward and studying something (once) in front of him, from the left to the right. We can explain it in different ways: 'he's studying the gap in front of him, before he'll jump over it' or 'he's studying the traps in front of him on the ground' etc. 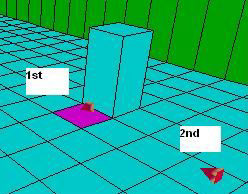 - The peak of the pyramid of AI_FOLLOW has to face in the opposite direction, compared to the direction of the jump. If it is higher, then he falls back to the gap. If it is lower, then he lands on the air, at the vertical position of where he jumps from, then sinks down to the floor. So, Von Croy has arrived to the first AI_FOLLOW, by an F30. He will face the gap. While Lara is further from him than 3 squares horizontally he doesn't perform any activity. If Lara is in the right distance, he will start waving to her. At AI_FOLLOW having 6, if you use Codebit 1+3 (!) then its meaning is changed, because he won't study the floor now but performs a standing jump - which is not one square but two squares long now. Switch on Codebit 2 and Codebit 5 at an AI_FOLLOW. While Lara is further from him than 3 squares horizontally Von Croy doesn't perform any activity there. If Lara is in the right distance, he will start waving to her. - The place where he arrives after the jump (grabbing the edge of the ledge) must be exactly at the same vertical position as where he jumps from. 1. For the run of the jump, Von Croy will also use the square behind him (skipping backwards before starting the run). So make sure he has enough place to run. 2. The things will happen in the abovementioned way only if Von Croy reaches the first AI_FOLLOW in a walking way. If he reaches that in a running way then the things can be less controlled - for example, maybe that will happen: if only the first F30 active, he will jump from the first AI_FOLLOW at once, even if Lara is far away. Then he goes to the second AI_FOLLOW, and doesn't show any activity. Activating the second F30 now, he will start waving to Lara. I hope you remember the cutscenes during the 'Angkor Wat' level. I'm talking about the short cutscenes when black strips appeared at the top and the bottom of the screen (as if you were seeing a flyby camera sequence) and you can hear Von Croy's advices to Lara. You can reconstruct those cutscenes in your level, if you activate F45 triggers. But what are these cutscenes, actually? All of this means usually the really important in these cutscenes is not what the player can see on the screen. The really important is what (s)he can hear. Each cutscene has its own audio file - in a hardcoded way attached to its cutscene (so Cutscene with ID A always has the audio file with ID B. ). In each audio file is saved what the player will hear during the given cutscene, seeing Von Croy's gesticulation. Naturally, for example, if Von Croy is standing in front of a big gap, gesticulating to Lara, then the proper audio file for this cutscene is in which Von Croy is talking about Lara how to jump over a big gap. - But, naturally, feel free to save what you want in the given audio. If the activation of an F45 trigger starts a cutscene, then the camera shots and the audio file will be started at once. (Each F45 can be activated only once automatically, without 'One Shot' feature!) Usually you should activate a cutscene when Von Croy is at the AI_FOLLOW that has the same number. - So, for example, activate Cutscene ID3 when Von Croy is standing at AI_FOLLOW having 3 in the OCB window. - Von Croy is just going from AI_FOLLOW having 1 to AI_FOLLOW having 2: he will be transported to AI_FOLLOW having 3 at once, and the cutscene starts at once. - Von Croy is at AI_FOLLOW having 2: he will be transported to AI_FOLLOW having 3 at once, and the cutscene starts at once. - Von Croy has left AI_FOLLOW having 3 yet, being at an AI_FOLLOW: the cutscene won't start. He will drop his activity. (I mean, if he does more here than simple waving then he will finish that special activity and do just as above: start and go till Lara is close enough.) Activate an F30 to send him further. To set an F45 trigger, type the given number in the Timer window of the trigger. So, for example, if you want an F45 trigger to play Cutscene#3 then type 3 in the Timer window of that trigger. - you hit the look key to interrupt both the shots and the audio. If a cutscene has ended/has been interrupted then Von Croy will leave the AI_FOLLOW at once. He will act exactly the way he acts when we move him from the starting AI_FOLLOW with 0 without activating an F30 trigger. So, he will move away only a bit from here towards the next AI_FOLLOW. Then he will move further if Lara comes closer to him. To 'really' send him to the next AI_FOLLOW, you need to activate an F30 that sends him there. 3. Be careful: possibly the game won't play some audio (WAV) files in these cutscenes, even if they have the right format for the old sound engine. Possibly the reason is the source of the WAV where you got that from. 4. If Von Croy has a special activity at an AI_FOLLOW (with or without OCB codebits: starting monkey swinging, jumping one square etc.) where a cutscene plays then he will perform it (automatically) only if the cutscene has ended/has been interrupted. 5. F45 triggers can be activated in any way: by directly Lara, by a switch, by a HEAVY trigger etc. 6. Let's suppose Von Croy is heading for AI_FOLLOW having 8, because an F30 sent him there. But he's only at AI_FOLLOW having 2 at the moment. You activate an F45 to start Cutscene#3. Now Von Croy will be transported to AI_FOLLOW having 3, and Cutscene#3 will start. The F30 to AI_FOLLOW having 8 has been annulled, so Von Croy starts acting now as if F30 to AI_FOLLOW having 3 had been the last F30 that was activated. 7. The only possibility to skip using an AI_FOLLOW if you use a cutscene with that skipped ID. For example, Lara arrives to AI_FOLLOW having 6 by an F30. But you don't have AI_FOLLOW having 7. So, if Von Croy leaves AI_FOLLOW having 6 in any way (automatically after playing Cutscene#6 or by an F30 that sends him to AI_FOLLOW having 7 or AI_FOLLOW having 8 etc.) then he goes to Lara and follows her tightly. This is the point where you need to activate F45 having 7. Cutscene#7 starts (shooting at Von Croy where he just is). After the cutscene, he starts towards AI_FOLLOW having 8 (as if the cutscene had played at AI_FOLLOW having 7). Now you need to activate an F30 with 8 or a bigger ID to put Von Croy back on the proper route. 8. Don't activate an F45 before Von Croy coming to life. 9. Lara will always be turned to and look forward straightly at Von Croy during the cutscene and remain the way like that after that - so even if she didn't face the AI_FOLLOW where the cutscene plays just a moment before the start of the cutscene. 10. At an AI_FOLLOW with a cutscene, it matters a bit more in which direction the peak of the pyramid faces. I mean, for example, if the next AI_FOLLOW is southwards from the AI_FOLLOW of the cutscene, and the pyramid peak also faces southwards, then, just after the cutscene, Von Croy wants to go in the opposite direction (northwards) first, but he makes up his mind, and leaves the AI_FOLLOW southwards. 11. Though, as you see above, you can use - with more or less success - Von Croy in your level, if that is not the first level, it doesn't mean you can use these cutscenes in your level with the new sound engine. I mean, with the new sound engine, the cutscenes are pretty messy, just bugs in the game, you can't have a chance for 'more or less success' now. 0 (31) - It is for the second AI_FOLLOW having 0, of course. 13 (45) - The same thing as with Cutscene#12. 25 (28) - The same thing as with Cutscene#12. 34 (68) - Almost the same thing as with Cutscene#12. But this time probably the southeastern corner is being shot. 43 (37, or 38 if you accomplished the secret puzzle) - You can't interrupt it by the look key. 53 (38) - You can't interrupt it by the look key. The highest Cutscene#ID I examined was 60 (this is the highest AI_FOLLOW ID in 'Angkor Wat' level). F45 triggers will also work with ID 8, 10, 15. But don't use them, they seem buggy. 2. If you haven't started Cutscene#43 by an F45, then start it now. 3. After the cutscene, Von Croy goes to AI_FOLLOW having 44 if Lara didn't find all the secrets, but goes to AI_FOLLOW having 54 if Lara found all the secrets. 4. Reaching to the new AI_FOLLOW, he waves to Lara, even if she is farther. (So he will do as if we sent him there by an F30. But we did not, and we cannot use that F30 even later!) - You can use OCB codebits now, if you want. 5. Activate F30 having 45 (46, 47 etc.) or 55 (56, 57 etc.) to send him further, as usual. You don't need to start the AI_FOLLOW sequence of Von Croy from 0. And it's good to know because it means you have two (or more) Von Croys in the same level (having different routes, of course). One of your Von Croys will use a lower sequence and the other one will use a higher sequence. - As I said above you can have problems if you activate an F30 that has a less number than the AI_FOLLOW at which Von Croy is. It is also true, if that F30 is not the part of the actual setup. So, for example, when you're just controlling Von Croy with the higher sequence but you accidentally activate an F30 that belongs to Von Croy (already dead) with the lower sequence, then that disturbs the active Von Croy. And all of this is also true if you use more than one object (VON_CROY, GUIDE, ENEMY_JEEP, HORSE+HORSEMAN) in a level with AI_FOLLOW's. I mean, eg. if you use (and 'kill') a Von Croy first, then you can use a guide after that, if they all have their own sequences. - So eg. if a Von Croy has a sequence from 0 to 15 then a guide can have a sequence from 20 to 32. - You can use HORSE+HORSEMAN together with Von Croy, the guide or the jeep at the same time, because the setup of the horseman doesn't have an F30. But don't forget: Von Croy and the guide can attack enemies, including the horseman on the horse. And it's also a good method if you have them in more than one level. I mean, eg. if you use a lower sequence for a Von Croy in the first level, then you'll use a higher sequence for a guide in the second level. Why? Because the game won't forget if you eg. used F30 triggers from 0 to 10 to send Von Croy on the first level. I mean, if you jump to the second level after that, and activate the guide, then he will act as if F30 triggers from 0 to 10 had been activated yet in the second level. If you want to know what variables or memory zones are then see the variable tutorial of Paolone or the Memory Zones tutorial on Skribblerz. You can use those memory zone fields even with Von Croy, naturally. - Custom_A and Custom_B fields are not useful with Von Croy. a, He stops the usual gesticulation just at the first frame after the cutscene. b, You've interrupted the cutscene but he's still studying his book.